When you’re selling online, especially to multiple marketplaces, sometimes it can be difficult to find customer service phone numbers. 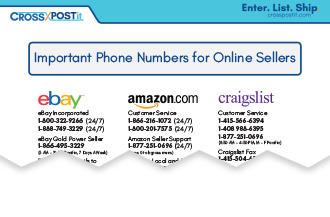 Here is a comprehensive list of important phone numbers for eBay, Amazon, craigslist, PayPal, Etsy, USPS, FedEx, DHL and UPS. Print it out – it’ll make your life easier!